There is a current shift in internet technology towards mobile and tablet friendly websites. The growing demands from customers and businesses means websites are becoming more complex. Your website is a marketing tool, just like paper based or TV or radio advertising, it is used to create new customers, retain old ones and essentially make you money. Users tend to want websites that look good, but most importantly they can learn to understand and use quickly to accomplish their task such as buying a product, or finding out what time your office is open. SoftSync provide web design solutions that are not only stylish and user friendly, but portray your company in its best possible light to your target audience. Our designers and developers have worked on projects for numerous companies around the world, across a wide range of sectors, business types and business sizes. Our strong backgrounds in web design, development and online marketing enable us to provide sensible, search engine friendly websites designed to provide the best user experience. Our vast experience at building websites has allowed us to see what features websites have in common, what features are bespoke to our clients and how users and clients interact with our websites. This has enabled us over time to develop a custom Content Management System and framework we can deploy on our websites. Our Content Management System is tried and tested, meaning we have more development time to spend on meeting your aims and objectives for the website, and allowing us to produce a high standard of service at a competitive fee. Our Content Management System is easy to use, can be adapted and extended to better suit your business needs, and has a small learning curve for your staff to be trained to use it. This allows us to provide the perfect website solution for you to get the most out of your investment. There are many design companies who leave clients disappointed with the end result of their website. As much as we are experts in web design, you are the experts in your own company and business field. By working together effectively we can make sure your website is successful. We like to give our clients the peace of mind that we will advise them through every phase of the development process and ensure we fully understand what they wish to get out of their website. We keep our clients heavily involved with the production of their website from the initial concepts and ideas, right through to the day it is launched and beyond. We do this by holding regular meetings to make sure everything is on track to meet objectives and by allowing our customers to see a live preview of their website when the designs are converted to code. Once your website is live, we like to keep in regular contact to provide support, advice and any extensions to the website you may require in the future. If you would like us to work with you on a web design project please get in touch. 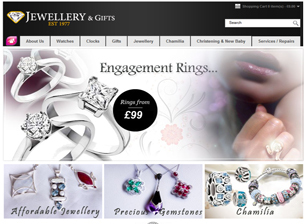 Jewellery and Gifts approached us to build an E-Commerce website for their shop based in Aldridge, Walsall. Their online store allows Jewellery and Gifts to sell their high quality goods, and share over 35 years of experience with a national customer base. The website has a fully integrated CMS allowing Jewellery and Gifts full control of the operation of their website which is also fully search engine optimised. 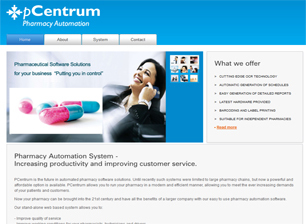 pCentrum is a pharmacy automation software system that needed a brochure website to advertise the product. The website is fully search engine optimised and presented in a simple, clean but elegant format, designed to generate enquires about the software that can then be converted into sales. Future features on this website are set to include an integrated software demo and online tour of the main software functionality. Streetly Balti is an Indian Restaurant and takeaway in Streetly, near Walsall in the West Midlands. The website is search engine optimised for the local area and features a customer testimonials area. It is a standard brochure website made to encourage locals to visit the restaurant. Future plans for the website include an online ordering and online booking facility, allowing customers to order delivery and takeaway direct from the website. "It is nice to interact with a company that produces fantastic products, and is easy to work with." "Thank you for creating a superb website! It is a pleasure to work with such a responsive organisation." "SoftSync provided an outstanding solution that delivers continuous results. We are happy with our eCommerce store." From software to web design and marketing we have the perfect business solution for you.